After the incredibly weak sauce that was FSS 2.0 Red Pads Grand Slam, the mystery figure that was a repaint of something that was already released in FSS 2.0, the GIJCC had a lot to make up for. Fans were absolutely livid about his inclusion, especially after how great the mystery thirteenth figure was in the first Figure Subscription Service. The fan anger was so big that it apparently led the GIJCC to change up their plans regarding the thirteenth figure. Originally, Arctic Dr. Mindbender was slated to be the mystery thirteenth figure and Frostbite was going to be the membership incentive figure. I think both figures were strong enough that the GIJCC didn’t need to do that, but after how pissed everyone was about Grand Slam, I totally get it. Dr. Mindbender is someone we already had, so it stood to reason that there might be nearly as much outrage as there was about Grand Slam if he’d filled that spot. As it stands, Frostbite is a great figure that finally fills out the Class of 1985 and I’m really glad the GIJCC made such a great figure. I think I may even need to go back into my storage unit and haul out my Pursuit of Cobra Wolfhound so I can reunite Frostbite with his vehicle. He’s such a great figure, I kind of want him back behind the wheel of his ride, just for completeness’s sake. The GIJCC pulled parts from a pretty eclectic group of Joes, but everything comes together very well to make a great figure. The legs are from 25th Anniversary Dusty and I think they work quite well here. They’re a nice basic pair of legs and really, that’s all Frostbite needs. From the waist down, he was never that fancy of a figure. The Dusty legs are a good choice and honestly, with as much as the Pursuit of Cobra Zartan and Shock Trooper legs trotted out for basic-looking figures, I find it kind of refreshing to see something different here. 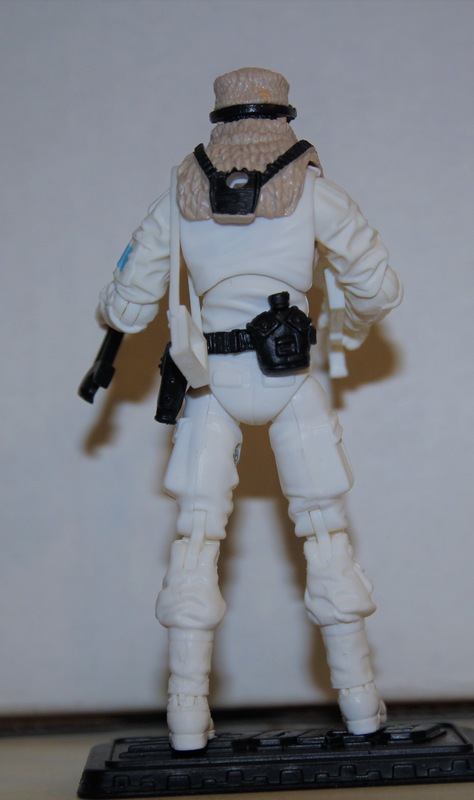 Around his waist, Frostbite has a removable belt with a functional holster on his left hip and a canteen molded onto the back. It’s a good belt and I’m sure it’s one we’ve seen many times before, but it’s a nice way to break up the figure a bit. Frostbite’s torso comes from Retaliation Cobra Invasion Firefly and that’s an excellent call. That is a great torso and since it’s a bit layered, it works well for an arctic specialist. Of course, thanks to the folks over at Boss Fight Studios, you’re not going to see that torso because they designed an amazing new chest cover to bring Frostbite’s chest in line with his old winter coat. The chest cover is designed to look furry and has a high collar and a functional shoulder holster. I really think it’s a great piece except for the high collar. Yes, having worn a lot of winter coats in my life, you would realistically want something that high, but as it stands, it negatively impacts Frostbite’s neck articulation and makes it look like he has no neck. It’s a decent piece, but it just kind of looks like Frostbite’s wearing a coat that doesn’t fit him all that well. The most surprising part choice to me is in his arms. Frostbite is using Retaliation Data Viper’s arms and while they’re an outside-the-box choice, I think they’re perfect for it. The arms are just a bit bulkier than the standard Joe arms without being too thick and I think that’s a great choice to replicate the sleeves of a parka. Plus, I’ve owned several winter coats with pads on the forearms like Frostbite now has, so I appreciate the appearance of some real-world details like that here. Finally, we have to talk about the brand new head that Boss Fight made for Frostbite. This is probably my second favorite new Joe head tooled up (sorry, Frostbite, your head still isn’t better than Cesspool’s) and it really makes the figure for me. Frostbite has a very serious look on his face and I think that works well for him. The beard is sculpted excellently and his furry hat looks great. Even though I’ve been collecting Joes since I was a kid, it still amazes me how much detail they can pack into these small figures. My only real complaint about the head sculpt is actually more tied to how the GIJCC accessorized it. 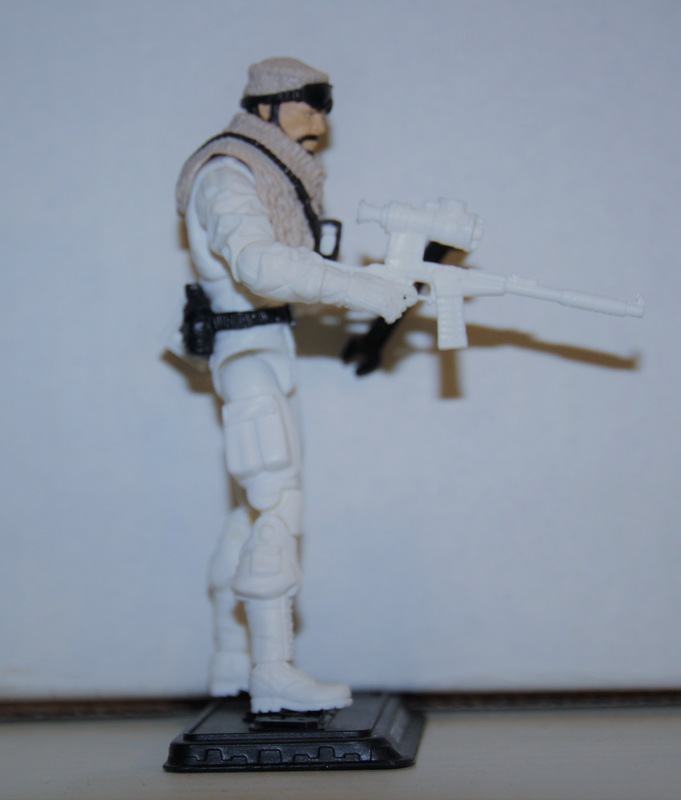 Like FSS 3.0 Alpine, the GIJCC decided to give Frostbite a set of removable goggles. They’re the same great mold Hasbro first used with 25th Anniversary Comic Pack Firefly. However, much like with Alpine, the goggles don’t really fit that well on Frostbite’s head. I’ve read some Joe fans were able to slowly stretch the goggles enough to bring them down on his head from the top. I was too afraid that I’d snap the goggles to do that, so I popped off Frostbite’s head and slid the goggles up from the bottom. It means that the goggles sit a bit low on his head, but I think he looks okay. However, the GIJCC should have just probably let the removable goggles go. Don’t get me wrong, I loved that 25th Anniversary Comic Pack Firefly had such great goggles, but goggles that size working well is the exception rather than the rule. I kind of wish they would have just let Boss Fight mold the goggles in as part of the hat. I know I wouldn’t have needed the option of goggles up or goggles down and I think most Joe fans would agree. Regardless, Frostbite’s head is still a great piece and it really shows how much attention the GIJCC felt this character deserved. I’ve mentioned before that, to me, arctic characters have a tendency to be just a bit boring. I’ll freely admit, Frostbite comes close to being boring, but the GIJCC used just enough color on him that I think he’s a decent figure. Yes, I’d love to see more Joe arctic specialists rocking some color other than white, but at least there’s enough other color on Frostbite that he’s visually interesting. Most of the figure is white and, for better or worse, it does make sense. 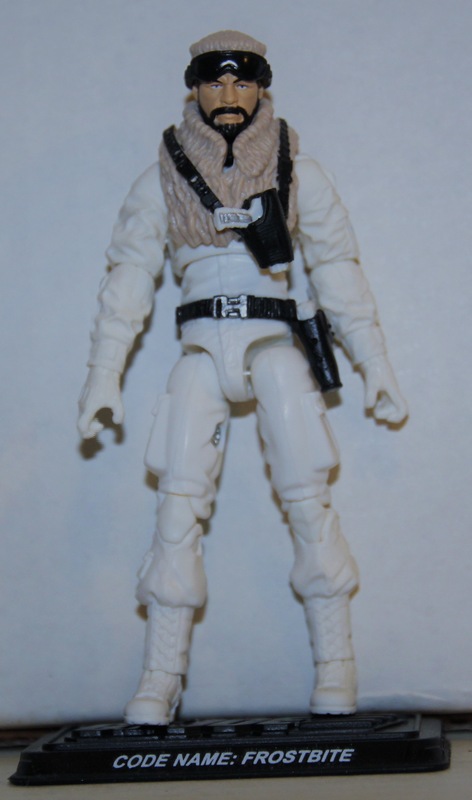 I do kind of wish the GIJCC would have used the off-white that Hasbro used for some of the Rise of Cobra arctic figures, but I would imagine that was enough off-model they were concerned about complaints about Frostbite being the wrong color if they went that way. The crisp white does look good and it’s a nice stark color. The black belt around Frostbite’s waist does help break things up a bit on the lower body, but he’s still awfully white. The white is carried up on to his upper body, but the furry vest, with its tan fur, really adds something to the figure. The black shoulder holster is also a nice touch and it stands out nicely against the very lightly colored body. The tan is carried up to the fur hat and again, the tan works nicely with the black used for the goggles. Frostbite still has the same cool blue tampo on his arm. Apparently on the vintage figure it was supposed to be a polar bear’s head, but I just don’t see it. It honestly looks more lupine than ursine to me, but I’m okay with that since the Snow Cat has been rechristened the Wolfhound. Truthfully, the emblem looks a bit like the images of the crest of House Stark from Game of Thrones, which is a direwolf. Regardless of what animal it’s supposed to represent, it’s a nice nod to the vintage figure, even if the GIJCC did have it switch arms. My only real complaint about the paint work is that Frostbite’s skin color is applied far too thickly. It really mutes the details in the sculpt and that hurts the figure’s overall look. 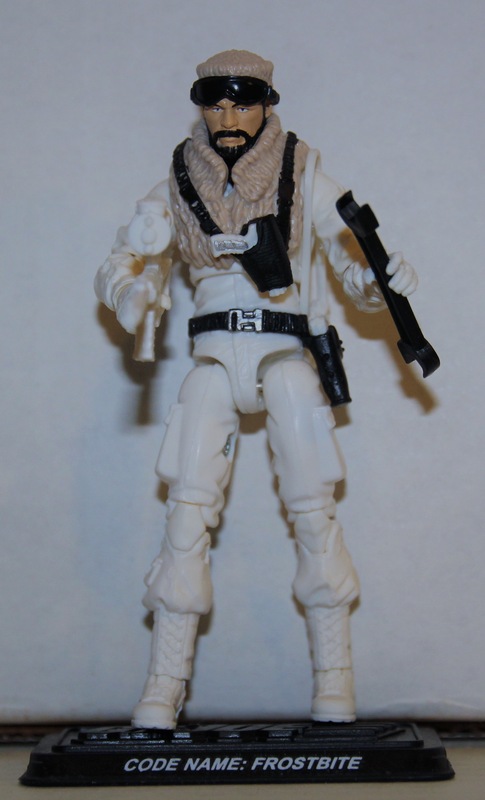 Even though he was originally a vehicle driver, Frostbite was treated very well in the weapons department and that continues to this modern version as well. Back in the day, Frostbite carried a really great scoped M-16 and while that exact weapon isn’t in the modern parts library, the GIJCC grabbed the 25th Anniversary Zartan rifle. It’s a decent stand in, though I do think there were a couple choices that could have been better. I understand they grabbed the Zartan rifle because of the really big scope, but it unfortunately also kind of screams Zartan. I personally think the Rise of Cobra PIT Commando rifle would have been a better choice because it’s a little more on model with a standard military rifle. The Zartan rifle makes Frostbite look more like a sniper than a vehicle operator and I think that’s a slightly bad call. Since he’s a former vehicle driver released carded, the GIJCC included the same large wrench that they first used with Cross Country last year and much like with Cross Country, I find myself strangely drawn to the piece. I like the idea of Frostbite having it as part of his kit because he’s going to be the first guy out of the Wolfhound in the event of it breaking down. He should have some equipment to fix his ride. Frostbite picks up a pair of pistols for his functional holsters. They’re good pieces and they fit snugly in their respective holsters. The vintage Frostbite only had a shoulder holster, but it’s nice that the GIJCC made sure to fill both holsters. Frostbite’s final accessory is a piece I really dislike. 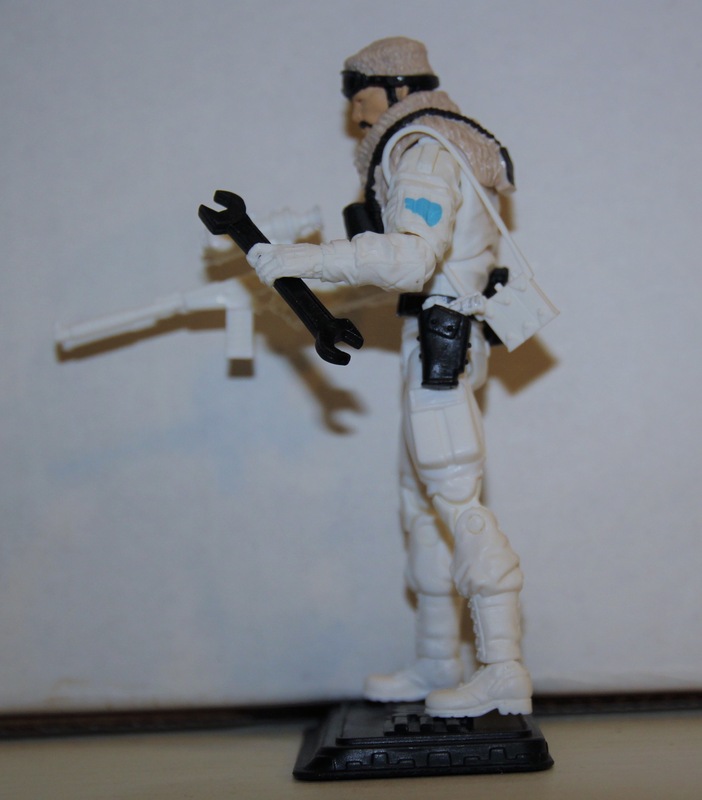 For some reason, Frostbite picks up the little satchel that Pursuit of Cobra Desert Battle Snake Eyes II had. It doesn’t really hang well from his shoulder and it’s a piece that’s not a reference to anything he had back in the day, so I’m not really sure why he has it. I don’t mind when a figure’s gear load differs from its vintage counterpart, but this is such a lame piece that I really just wish the GIJCC had left it behind. While I like Frostbite’s equipment, the pistols, rifle and satchel do create a bit of an issue for me. All of Frostbite’s weapons are white, but his wrench is black. Considering Frostbite’s vintage rifle was black, I don’t really get why the GIJCC decided to make his weapons white. Heck, even the pistol molded on his chest was black back in the day. I’ve never been a super big fan of white weapons, and it makes even less sense for Frostbite to have him because his vintage gear was originally all black. Don’t get me wrong, I understand why the GIJCC went with white weapons for their version of Iceberg since he had white weapons back in the day, but doing it for Frostbite is just kind of odd to me. Then not committing fully to the white by making his large wrench white just makes the normal-colored wrench stand out a bit more compared to the white weapons. While his path to release was a bit circuitous, it’s nice to finally have Frostbite in my hands. The Class of 1985 is finally all back together and it’s nice to see that. I’ll admit, Frostbite is a figure Hasbro probably should have released, but if they had, I’m not sure it would be as good as this one is. I’m increasingly torn on product from Hasbro proper because it doesn’t feel to me like they’ve been taking the chances on character choices that they did back in the day. Part of what I thought made the Joe brand so successful, even back during the Joe Vs. Cobra era, was the wide variety of character choices. Yes, the modern line is focused on recreating older figures, but even if it’s just nostalgia-based, there are a lot of characters to choose from. However, Hasbro seems to be playing it safe by making a lot of versions of Duke, Cobra Commander, Snake Eyes and Storm Shadow. Don’t get me wrong, I have fond childhood memories of all those characters, but that doesn’t mean I want to see only those characters in my Joe line. Guys like Frostbite are just as important to the Joe brand as the big names, but it sometimes feels like Hasbro doesn’t quite get that while the GIJCC does. I still love the product Hasbro is putting out, but if I want to get my fix of characters that aren’t as well known, I seem to have to go over to the GIJCC rather than Hasbro proper.